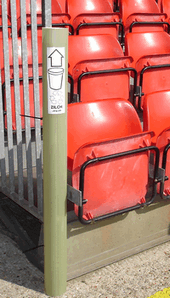 In the grandstand, at the festival or under the marquee, Zilch cup tubes provide you with a cost-effective, compact and convenient way to collect the disposable cups from which your guests have been drinking. Cup tubes are designed to be floor-standing but come fitted with a tapered plug which means they can be lifted and carried without their contents falling out. 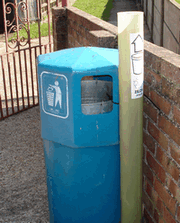 Two releasable tie-wraps are provided with each tube so that it can be attached to a railing, post or bin and then easily released for collection and/or emptying. This comprises a pair of 30mm single-screw fixed toggles complete with screws and rawlplugs allowing the tubes to be attached to a wall or fence. If your cup usage includes cup lids, an adjacent mini-bin can be piggy-backed onto the cup tube to provide a receptacle for the lids. For a PDF and printable version of this page click here.